Understanding Pharmaceutical Class Action Cases | Hupy and Abraham, S.C.
What Is a Pharmaceutical Class Action Lawsuit? We trust pharmaceutical companies to release drugs and medical devices to the market that are safe and beneficial for the people who take them. Unfortunately, many people across the nation are still harmed or killed by dangerous or defective drugs and medical devices every year. If you have been harmed by a prescription drug or medical device, it is possible that other people have shared similar injuries after also taking the same drug or using the same medical device. 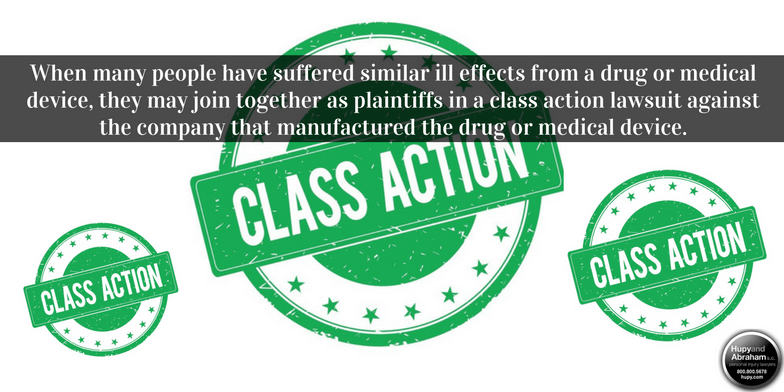 You may choose to get in touch with a class action lawyer and join together in a pharmaceutical class action against the company. What Is a Pharmaceutical Class Action? When many people have suffered similar ill effects from a drug or medical device, they may join together as plaintiffs in a class action lawsuit against the company that manufactured the drug or medical device. Thus, they can pool financial resources and work together to pursue damages for the many people who have been harmed. Faster results. In many cases, a class action suit may be hard more quickly than many individual lawsuits pending against a pharmaceutical company. More resources. Because class action lawsuits represent a large number of people who have been harmed, it is easier to get the expert witnesses and investigators needed to secure a successful outcome. No out-of-pocket financial risk. It won’t cost you anything to join a class action case. Class action cases may also allow more people access to the justice system since it might not have been economically feasible for each individual plaintiff to file a case alone. Who can file a case. This person is known as the lead plaintiff. When a case can be filed. The statute of limitations applies to class action cases. How damages are distributed at the time of settlement or verdict. While every plaintiff may be entitled to damages, the exact amount may be based on the plaintiff’s specific injuries. Of course, other rules also apply to each phase of a pharmaceutical class action case. For example, there are court rules about filing pleadings, about discovery, and about recoveries that are important to know. There are rules that apply to every lawsuit, and pharmaceutical class actions are no exception. However, you do not have to worry about every rule. Instead, you can find a pharmaceutical class action lawyer you trust to help you navigate the complicated web of rules and protect your rights. Please find out more about how a class action case works by watching our free videos and starting a free, no-obligation online chat with us now.